I spend all my money on experiences, and I'm finishing up studying the design of them in grad school, as well. I'm going to ruin everything by telling you how badly designed your world is! ...But it'll be fun. Really. Last weekend, Six Flags Over Georgia debuted a virtual reality (VR) roller coaster experience using headsets — the first of its kind in North America. The technology used is quickly becoming mainstream, with the majority of applications thus far residing within the entertainment industry. Fortune.com proclaims that 200 million VR headsets will be sold in the next four years, and new VR apps are popping up every day. Moxie’s Future Experiences Lab has various forms of this technology on display, and many of us in the Atlanta office have had the chance to experience it firsthand. As one of those lucky #MoxieMakers, this Six Flags announcement was of particular interest to me. Yet my personal investment doesn’t stop there: I’m a huge fan of roller coasters. I’ve ridden 104 different roller coasters, gotten stuck on the tracks a dozen or so times, been “rescued” twice and only once thought I might actually be about to die. I’ve ridden the tallest and fastest roller coaster in the U.S. and two of the oldest in the world. So last weekend, I set out to ride the newest: Six Flags Over Georgia’s “The New Revolution,” a VR experience retrofitted onto the existing roller coaster Dare Devil Dive. Why Six Flags? How Six Flags? Six Flags isn’t famous for being the most innovative theme park company. Compared to Disney and Universal, its smaller parks are sometimes regarded as one step up from the county fair. And among Six Flags’ family of parks, Six Flags Over Georgia is near the bottom of the totem pole: no record holders, hardly a big tourist attraction and known to locals as a smelly, scorching, overpriced playpen for youth groups and teenagers doing anything they can to escape their parental units. Yet, as an Atlanta native, I view Six Flags Over Georgia as my home park, and I continue to love it out of familial obligation. So imagine my surprise when I received the e-blast announcement about its venture into VR. While a few other theme parks worldwide have announced their plans for VR coaster experiences, this announcement popped up only a week and a half before opening to the public. Such a last-minute announcement makes one wonder — had Six Flags Over Georgia rushed into this project to keep up? Was the park planning it all along and keeping quiet? How are they going to pull this off? Is this going to work at all? Feeling a mix of excitement and dread — and finding myself extremely curious about the experience design of this new addition — I renewed my season pass and planned to try the ride out on opening day. In case you’re not familiar with the Samsung Gear VR, here’s some background: Samsung’s Gear VR (Gear) headset is one of the more affordable options for VR that came out this year, among the likes of Oculus Rift and Playstation VR. Gear cuts its price by utilizing a Samsung Galaxy phone in its viewfinder. When combined with the wraparound headset, this creates an immersive experience by blocking off all outside visuals while simultaneously responding to your head’s movements. So far, VR has been used most commonly for gaming, but developments in other industries are rapidly progressing. The healthcare industry will soon benefit — both in training environments and as a physical therapy tool. Museums and other cultural attractions will become accessible to more people worldwide, and students of all ages will have new ways to learn (e.g., imagine taking a VR field trip or even shrinking down to cell-size, Magic School Bus-style and taking a ride through the human body’s circulatory system). Many of these applications are still in the early stages, but for entertainment, the ball is very much rolling. Opening day was Saturday, March 12. I went straight to the coaster of interest, Dare Devil Dive, which was sporting an awkward subtitle, “The New Revolution.” (Spoiler alert: I never made it on the ride, but I did manage to at least make some observations.) The poorly proofed and hard-to-read sign out front provided some insight into what to expect. Adjust headset, including chin strap, and then move the viewfinder off of your eyes to board the train. After the coaster’s safety restraints are in place, move the viewfinder over your eyes, and look at a QR code to activate the program and calibrate. Upon approach, I noticed all the riders holding their headsets in place. My hypothesis: Either the headsets are uncomfortable or heavy or (how fun) both. “Oh, this is going to be miserable,” I thought — incorrectly: I later learned that the headset holding was inspired by an interactive element. As riders climb the lift hill, they have the chance to fire at targets using the touchpad on the side of the Gear. And according to online reviews, it’s a fun distraction during the lift hill downtime. Beyond this point, for now, I must rely on secondhand reports. After about an hour in line — and only about three hours of total opening time — Six Flags Over Georgia announced that they were ceasing operation of the VR headsets. I couldn’t say I was at all surprised by the technical difficulties, especially given the seemingly quintupled loading times we were observing. Was Six Flags unprepared for this experience to go live? What had gone wrong? While the park provided no details in its announcement, the ride’s supervisor was kind enough to enlighten me about the issues they had faced so far. The call to cease operation of the VR portion of the ride was a nationwide decision: All nine coasters running “technical rehearsals” across Six Flags’ parks had been shut down within four hours of opening. Despite mostly positive reviews as people stepped off, riders were experiencing too many problems. At other parks, headsets had come off of riders’ heads, and phones used in the viewfinder had popped out of their encasements. Software issues were causing blurriness and dizziness or, occasionally, the program would cut off and black out mid-ride. Considering these major safety concerns, the higher-ups had decided to pause the trial runs until they could do some nationwide troubleshooting. Oh, well. It was an admirable and ambitious effort. Hopefully with a few tweaks in either construction or procedure, the VR experience will be up and running again soon. There’s plenty more to be done in this industry with VR, so it seems almost certain that solutions will be discovered and applied. While Six Flags may need a little more time with user testing, there are a handful of other interesting applications up and running in the themed entertainment industry. 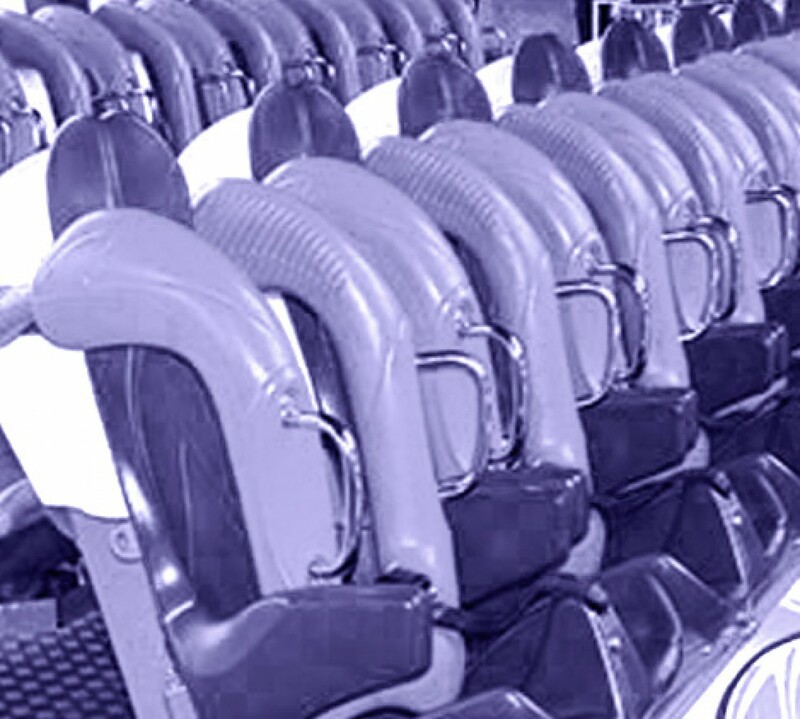 A “backwards” version of the virtual coaster keeps riders still in a theater-like environment and provides tactile feedback via a motor in each seat, as riders experience the visuals of a roller coaster. Immersive environments, which feature mapped tangible objects within their playscapes, are becoming available for gaming and exploration. Last year, we heard reports of Avatron Park, which name-dropped all sorts of VR technologies, but we haven’t seen any official updates since November. Moxie’s representatives at SXSW report that Oculus is claiming sports as the next frontier: “In the near future, we won’t be sitting around watching sports; we’ll be immersed in them.” Oculus even goes a step further and says that its particular application will utilize “mixed reality” glasses that layer holograms on top of the real world. That variation could work well for rides that are already well-themed and for continuous, park-wide experiences people can enjoy while exploring or while waiting in line. The mixed reality would prevent the need to map every detail — and person — in the environment, while still allowing for a VR element. In the particular case of Six Flags, once the headsets are worked out, the addition of a sound component seems like the next and easiest step — since that technology is already in place in many coasters worldwide. A company called VR Coaster seems to be involved in most of these existing or upcoming projects, including Six Flags, but its demo operates slightly differently from what happens at Six Flags Over Georgia. I’d personally prefer the setup outlined by VR Coaster, in which you rent one headset and use it all day — especially as this type of experience becomes more and more popular. But questions remain: How will this affect the rider experience in the big picture? Will lines take five times as long? Is that worth it? How are they going to maintain — and retain — these headsets in the inhospitable environment of a crowded theme park? Should this even be Six Flags’ priority at this point or should the park instead be focusing on innovating bigger picture patron experience elements — like having live wait times listed anywhere in the park or on its app? Only time will tell, but personally, I remain cautiously optimistic about the new frontier in themed entertainment. I did email Six Flags to ask how the VR ride was progressing (or not). According to the park’s Communications Manager, “The New Revolution at Dare Devil Dive is open to all guests on public operating days.” Suffice it to say I’ll likely be revisiting the park some weekend soon for coaster experience number 105. FOLLOW-UP: I returned to Six Flags Over Georgia in June to try it again. After being told that the line of about 45 people would take an hour and a half because “it takes a long time to set up,” and after actually waiting only about 45 minutes (always better to overestimate, sure), I did indeed experience this experiment in VR coasterdom. I plan to write all about that in the near future! SIDENOTE / FUN FACT: Me and those kids in the promo photo with the Gear VRs Photoshopped on their faces go way back. Five years ago, Six Flags used Facebook to recruit extras for the Dare Devil Dive promo shots and commercial, and I got to be a part of it, riding it before it was open about 20 times. Now, those photos are everywhere, and I’m still not sure I’ve found myself in any of them! I wear baggy ol’ judgy-pants. I usually have strong opinions on if things are done well, and it was beaten into me in Liberal Artsy undergrad that I’d better be able to justify those feelings with actual articulated reasons and arguments, or else they don’t count and are not real or whatever. If I’m going to be feeling these annoying feels, I should at least do something with them. I’ve spent the last two years torturing my psyche with graduate school, studying user experience design. That includes topics such as universal design, design of interactive environments, and industrial design, so now everything that doesn’t work properly annoys me instantly, and you’re gonna hear about it. I’d love to some day work in the themed entertainment design industry, so ranting about writing thoughtful critiques of these types of spaces and experiences now seems like a good way to work out what I could potentially contribute. I tend to forget all the fun times I have at theme parks as they all blend together after a while, and that’s just sad! Bonus! Despite this blog’s cynical and alliterative moniker, I may post about other entertainment spaces, as well, such as museums and events. The core concepts are often quite similar, and remembering those things, too, wouldn’t be the worst. Cool? Cool. So, soon… Coaster Killjoy shall begin! Like, after graduation. Yeah. Oof. Six Flags Over Georgia, my home park. Not by choice, but, you know… It’s like family. Smelly, apathetic family. King’s Dominion: Land of Elusive Entrances. Six Flags Magic Mountain, The Wacky Knee Chronicles: A study in making my boyfriend push me up literal mountains in a wheelchair. The Georgia Aquarium, the most aesthetically pleasing hot mess you ever did fail to get around efficiently. Theme Park Hacks: Sneakity Sneakrets and Strats. Disneyland: The Land Disney May or May Not Have Forgotten…? …guys? Maybe, just for fun, recaps of the exploration of abandoned parks, that could totally just be a completely fictional narrative using photos found on the internet and which did not at all involve trespassing in any way, shape, or form because trespassing is bad and dangerous. An Adventure Inventory, in which I go through all my ticket stubs and check-ins and see what I’ve actually been doing with my life. Alright, so, I’ll get the churros and you get the pretzels, and we’ll meet at the FastPass entrance to Space Mountain? Yeah? Cool.